It's In Other Words Tuesday and our host this week is Patricia of Typing One Handed. When dealing with a friend who is going through problems and challenges, it can be tempting to just go in and try to fix things for her. But I believe that in the midst of our trials, there are important lessons to be learned. So jumping in to fix them isn't always the best answer. I've been going through a long season of challenges. These are challenges I'd prefer not to have to deal with. And right now, they seem to be unending. Some friends don't know what to say so they avoid you. Others feel they have to give just the right advice and when they leave I feel worse. And then there's Kathleen of Sassy Granny . We've had the pleasure of meeting in person and spending time together on a number of occasions. That is until she moved back to the Seattle area. However, she's just a phone call away and I find it so easy to talk to her. She's a good listener and will give me feedback but doesn't take over and tell me what to do. I noticed that everytime I called Kathleen or we spent time together discussing things, she always ended our time together in prayer. She didn't have all the answers but she knew where to point me to; Jesus. There were so many days when I was a younger believer that He was my last thought (when all else failed). Life brought me many trials, enough so that I had to lean on Him first lest I die of heartbreak. I forget sometimes ... then I remember again. He is faithful, and I am so honored to honor Him. It's a lesson for me to learn. Run to the One who has all the answers. He knows what I need better than me. Thanks for sharing! Definitely a lesson that we should keep learning. Praying for you. Definitely a friend to glean from, Debbie! Thank you for sharing those words of wisdom with us today. All I can say is: I wish I'd read this BEFORE I had applied makeup! You bless me richly, friend; and in turn He is honored. It's right order, and ever-and-always He is glorified. Oh, yes, Debbie, and such a friend is better than silver and gold! I have such a friend, and she will discuss an issue for a while, but then suddenly she will bow her head and begin to pray out loud, knowing that we need to give this to Jesus rather than hash it over ourselves. With blogging, the Lord will sometimes lead me to a blog and His Spirit urges me to pray for that person' needs, so I am trying to follow my friend's lead and just bow my head and pray! I also agree that going through challenges is a time of learning and growing closer to God. It is so painful at times, but the results help me to be closer to the person that He wants me to be. 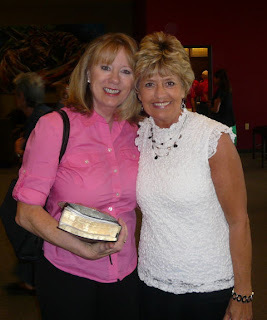 You have found a wonderful, godly friend in Kathleen; what a blessing! Amen!! Enjoyed your wonderful post today! I love that picture of you and Kathleen, and I love the way she encourages you! What a blessed friendship! What a special tribute to your friend. Makes me want to dig up one I have of my close friend. Thanks for sharing. How cool that the two of you met! I got to meet Jackie from Fresh Oil Today. There's something about meeting a blogger in person...you develop this bond that might not have happened in blog land. I love how God is hooking all of us up! This is a wonderful post dear friend Debby. Hugs. Such a blessing Kathleen has been for you. God truly does supply all ours needs according to His riches in glory. Blessings. I have read your past posts, the ones I didn't get to read... and I am glad to be current again with your blog posts. I did love this one so much, especially since I am just moving on after a sad experience with a friend. 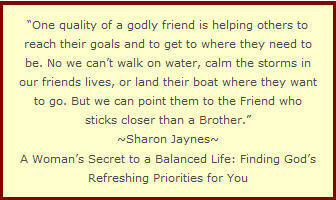 I love the quote from Sharon Jaynes. It is so timely for me. 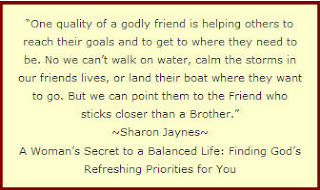 We cant be the self appointed quick fixers for our friends, that is so true. I appreciate that you have a good friendship with Sassy Granny. It is good that she encourages you, and that she helps you so much. A few months back I visited her blog and really loved how she shared her heart. I did also want to have a blog friendship with her... but somehow my comments were not responded to. But that's really okay. Friendships are never forced, right? I am just so happy for you that you have a friend who encourages you at the time you need it. Praying for you, dear Debbie. May God continue to amaze you with His love and kindness. This is SO beautiful. Kathleen and you both are so special!!! GOD always sends just the right word from HIM through the person HE selects at the moment we most need it. Do You Want to Study the Bible?